In reward-based crowdfunding there are two common approaches: one-time campaigns and ongoing or subscription-based like the kind offered by Patreon, Contributoria and Beacon Reader. The campaign approach made popular by sites like Kickstarter and Indiegogo can have huge payoff but the subscription model may be more sensible approach for a journalist with a mortgage and kids who can’t afford the risks of one-time campaigns. At least that’s Jesse Brown’s take, who spoke earlier this month with GigaOm’s Mathew Ingram (by the way if you enjoy this blog or new media you really should be follow Ingram on Twitter). 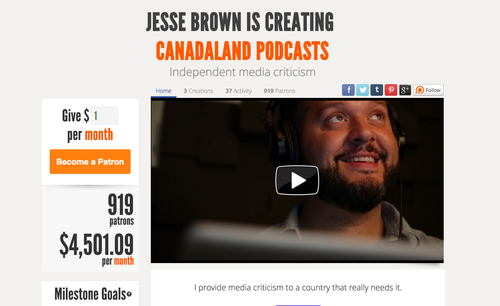 After a career in Canadian public radio, Brown used the site Patreon to fund his podcast Canadaland about Canadian media to build a subscriber base. Kickstarter and Indiegogo were ruled out because he didn’t want his work to be on a temporary timeline. He needed sustainable income in order to create a show to last. Short term funding wasn’t an option. 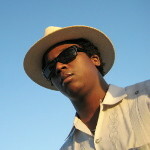 The show reached its first goal of $1,000 a month in hours. At the time the GigaOm piece was published Oct. 8, Brown’s campaign had $2,600 a month. A second milestone to raise $4,000 a month goal was hit earlier this month to pay operating costs and salary. Canadaland currently receives $4,500 a month from more than 900 patrons. A $10,000 a month goal would turn the podcast into a news organization. Another upside: The subscription model can has helped forge an intimate, direct relationship between Brown and his listeners, he said. “What’s interesting to me here is that Patreon actually brings alive the famous notion by Kevin Kelly of 1,000 true fans. That notions brings forward the idea that if you have 1K fans you will be able to survive,” she said. Patreon can be used to fund artists of all kinds. Aitamurto uses the platform to fund a comedian. Read the complete article on GigaOm.